This article was very interesting on raising questions that we have been discussing over the semester when having to do with the future of how museums are going to operate. Constantly in class we have discussed what should museums do to help people participate, interact, and learn from museums. Time after time again we keep circling over the same answer we said make museums interactive. People learn more when they are able to be feel and touch. 4) The chief aim of interpretation is not instruction but provocation. Learning is best learned when provoked to learn there has to be an excitement there for it. 5) A whole rather than a part and address a whole person rather than a phase. Remind people of the bigger picture that is taking place and relate it to whatever is being addressed. 6) Interpretation to children should not be a dilution but a fundamentally different approach. I believe that following the rubric that we set up museums can change and maintain their identities of guardians of culture. If they follow this and still use social medias then there is a good chance some of that identity won’t be lost. For me it was interesting taking this class not having a great perspective on what Museums true goals were. Firstly I thought that Museums were just big buildings that were specifically for paintings and art. Things that I thought would never interest me. On the contrary I learned that museums were meant for learning. They stood for houses of physical education things that you could look at and learn from. However, now museums aren’t staying true to their intentions. I say this because through taking this course and reading about strategies and ways to get more people interested and involved it seems that the education aspect of museums is beginning to get lost in the transition. Museums are beginning to become more involved in staying relevant and trying to conform to the new digital age. Which is completely relevant for them if they want to continue being a business, however that only stresses the lack of attention to the education aspect that seems to have gone missing in modern museums. But the new ways that digital tools allow aren’t allowing the objects to be expressed how the original curators intended them to. People just look, they don’t learn anymore. They just look to look because it is what we as a society do we look through pictures not actually caring about what is in them unless we are passionate about them. Although this article was written in 2010 it only stresses how much the time has changed us we are more developed into the digital age taking us further from the purpose of educating and rather focuses on what is in right now. It begins to pose the real serious question of whether museums are tools of learning or just a big place to put old crap in an organized fashion. All semester we have read articles that pertain to how a museum should be curated, how items should be conserved, and how museums need to entertain the public while still trying to educate them. All of these ideas that have been followed by museum majors for a long period of time ever since the shift in museums paradigms after the WWII. But are these teachings still relevant? Are students learning the “modern” way of running a museums? Museums have changed and therefore so must the teaching styles. Proposed a very interesting question at the end of their article are students being properly trained for the shift in the modern museums? This is speaking of the new digital age that museums have incorporated into their daily routines. I know that in our own class we have always related most of our teachings to how it is relevant today. Especially when it comes to the social media and how they are such a big part of our society now a days. For example an extinct dinosaur has a twitter page and it tweets daily. This is just an example of the world that we live in. However I am not trying to critique the world that we live in, I am critiquing the way that museum major are being taught. If this new digital age is going to completely change how we perceive museums then it is time for a change in the way museums are being taught. We might as well teach museums students how to run a successful YouTube channel and what filter to use on Instagram pictures than how to set up an exhibit. There should be more of a stress on being a relevant “hot” museum rather than a museum of learning. Over fall break my parents and I went to the Milwaukee Art Museum. As we entered we were first greeted by a museum worker who saw that my parents were taking pictures of the amazing architecture. These workers were all very friendly and willing to help. They even pointed out areas that are great for taking pictures. When walking through the museum, permanent exhibits most were easy to maneuver and well laid out. The overall flow of the museum was straight forward. There are two main isles and one of them leads to the other galleries while the other one holds sculpture and ends at a room for students. The most problematic exhibit to me was one that happened to be one of their temporary, special exhibitions, advertised on their website as a headliner. It was titled Of Heaven and Earth, 500 Years of Italian Painting. Although this exhibit was one of my favorites because the of the works of art I got to see, it was also the most frustrating. It is an impressive collection that came from the Glasgow Museums. However, for an exhibit that is suppose to be chronological it was very hard to follow. There was often two directions that one could go when entering a new section. The visitor could go left or right and each direction felt like a different time period or topic. Thus, when going through the exhibit my parents and I often got confused about what time period we were in and not sure what direction to go. Often I found myself going from one side to the other to the middle. There was no clear path to the exhibit. The museum attempted to guide the viewers through wall texts. The exhibit starts out with a wall text describing the overall exhibit and the era. Then moves on to smaller ones throughout the exhibit to explain the different time periods making up the 500 years. These attempted to direct the audience but the route often did not feel natural. This often caused great confusion because I felt conflicted between the various ways to go through the exhibit. The confusion in layout caused the exhibit to feel crowded because there were people walking in different directions. Each person was trying to fine a course. I found myself going through it differently than my parents. Since, there were labels and bigger wall texts some context was given to the viewers. Mixing that with the odd layout meant that that some sort of knowledge of art from this time period was necessary. The walls of this exhibition also changed colors a lot. It seemed that each new wall was a different color. At first I thought it was synced with the time period but then it became more and more frequent and no longer fit that pattern. There was often a wall stuck in the middle of the room that had a couple paintings on it as well. This made me even more confused and was never sure when was a good time to look at the middle wall. There was nothing in this exhibit that truly guided the visitor. Another issue that I had with this exhibition was the lighting. Part of it may have been due to my height and the amount of lacquer that had been put on these paintings as a form of conversation but there tended to be a large glare on most paintings. In my opinion they could have worked to find a way that caused less of a glare. This glare made it really hard to see the details of the paintings and during these 500 years detail was a very prominent part of their painting style. Even though the exhibit Of Heaven and Earth had many faults it was successful in demonstrating the art the 500 year span. It also featured big-name artists such as Botticelli and Titian. The collection is made of up of important religious scenes such as the Annunciation, and also secular scenes such as landscapes. Despite all of the frustrations I had with this exhibit it was one of my favorites in the museum simply because the works of art and it did not cost extra to enter. 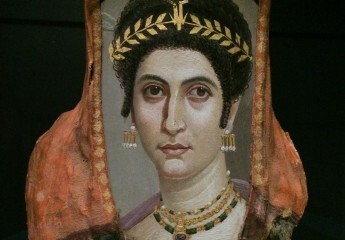 It was a very enjoyable trip to the museum and it was not overwhelming as a whole either. I would suggest going to the The Milwaukee Art Museum to anyone because the building itself is a work of art and you get to see wonderful pieces of art that are prominent in the art history. As a kid, I loved going to the zoo. What kid doesn’t, really? The institutions are basically built for children, and yet everyone, big or small, has some level of fascination for exotic animals. A few weekends ago I went to the Henry Vilas Zoo in Madison, Wisconsin. My mother had told me she was going to take my grandparents and I jumped at the chance to, in a way, revisit my childhood. I could not wait to experience that sense of wonder again. Now as an adult in museum studies, my perspective and thoughts on zoos have changed. The Henry Villas Zoo has always boasted about its free admission. This obviously allows for people of all financial backgrounds to enjoy the zoo. The economic aspect of a Zoo is definitely not something I considered when I was little. But a zoo with an admissions price, just like an museum-like establishment, limits and makes elite the people who can visit. The Henry Villas Zoo is sure to avoid this issue as it does not even charge for parking. Free admission has its problems as well though. No admission fees mean less money for the zoo. I can remember many enclosures, such as all of the bears, which were open when I was little, that no longer exist. Donations have to be lucrative. It is perhaps understandable, though, that the pathways aren’t perfect as unlike museums, zoos house, care for, and thus pay for, living animals. This creates a whole new set of issues. It was impossible not to notice how pathetic the animals’ enclosures looked. Whether the animal was small or large, their enclosure looked way too small. One of the most disturbing enclosures was the giraffes. Their enclosed space was small and the ground was completely dirt. The only interruption of the flat dust was a tall metal pole with hay at the top…not a very majestic sight. The tiger enclosure was filled with foliage. But, when we were looking at the tiger, he was just constantly pacing back in forth, clearly not happy. The experience of seeing a tiger on the prowl was exhilarating, but the limited space was not able to be overlooked. So how ethical is it really to keep animals in small cages for the amusement of little kids? Even though some animals are protected by being in the care of humans, animal sanctuaries are arguably a much more comfortable and humane place for animals. All of the issues are things I have only considered about zoos as an adult. As a kid, the Henry Vilas Zoo was just a fun place to go to and be amazed by amazing creatures. It is maybe unfortunate that the magic of the zoo has been demystified for me. For now, though, there will still be plenty of blissfully ignorant children going to the Henry Vilas Zoo and having the time of their lives. In terms of the website, it is actually quite impressive. It is very appealing and up to date. The colors and pictures provide a visually appealing layout for the viewer and the tabs at the top make for easy navigation. The research and collections department provide solid information for anybody looking to build knowledge or just to view images of collections. The website does a great job of combining both the images and text to create a nice balance for the viewer. It was interesting to see several images of the exhibits we actually seen in person. The comparison was something we had to make note of. During our visit to the Milwaukee Public Museum we were able get a glimpse of some artifacts both first hand and behind the scenes, also. Being able to go back into the collection rooms with all the artifacts that are housed in three rooms was one of the most interesting parts. One of the best rooms was the mammoth room. It was amazing not only because it had the remains of the mammoth in it, but because it also had the skulls and a variety of osteological artifacts that most people aren’t able to see. Furthermore, actually seeing the exhibits was fun and the most memorable. Being able to have bugs crawl onto your hands and to see all the bones that they had on display, especially the massive whale. Also, the behind the scenes material was wonderful. It was cool to be able to look into places that many people do not typically get to see when visiting a museum. We got a true sense of the under the radar business that needs to take place in order to allow a museum to be run. For example, the botany department was interesting because of the special Native American plants that they held. The department with the all the bottled up fish and amphibians was kind of creepy but is something that is tough to find anywhere else. They even had a narwhal horn and it was awesome. We also got to be see the behind the scenes of the taxidermy. Things that would never get shown on their website reinforce the idea of how much better it is to see things in person. Overall, it is much better to be able to see things in a physical representation rather than having to see things through a computer screen. It becomes more memorable and allows certain exhibits to trigger emotions. When an exhibit can trigger the emotions of its audience, it becomes significantly more memorable and exciting. Recently some of the class went on a field trip to the Angel Museum in Beloit. The museum is housed in a historic church, built in 1914, and is run with the help of Joyce Berg. The majority of the objects being shown are from her own collection, and that’s why she wanted to open the museum, to show the world the largest collection of angels. Though it might seem like an odd theme to focus on with a museum, the collection shows such a varying amount of angel figurines that it becomes a fascinating place to explore. 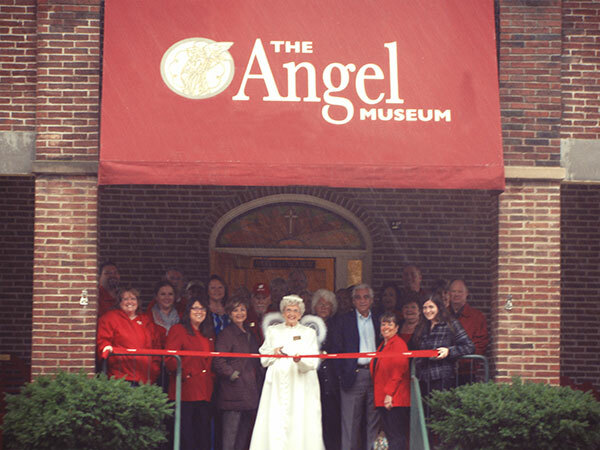 As we walked into the museum we were greeted by Joyce Berg in an angel costume. This is her typical attire, and as she later explained, she’s gone through numerous costumes- all including a halo, wings and dress. The museum is one room with around 6 x-shaped display cases, all sides showcasing shelves of angels in all shapes, sizes and materials. The collection ranges from angels of the month to an angel smoke alarm to a garfield angel. Each shelf holds,depending on size, 25-40 angels. Towards the front of the room was the donated collection of Oprah’s black angels. This is one of the more popular aspects of the museum, although Oprah herself has never been there. She also has a collection of magazine and newspaper articles about the museum- all focusing on the odd idea of housing an angel collection. After visiting the museum I decided to look at the website to see how the it was represented on the internet. I was unable to see many pictures of the collection and the website mainly focused on events that are held at the museum as well as ways to volunteer. There is also a video of Joyce Berg talking about the museum and it’s start, but again there is hardly any footage of what the museum looks like. I would suggest adding some pictures or talking about some of the odd items that are housed to attract more visitors. It’s hard to draw attention to a museum that houses an odd collection. It’s more of a tourist destination than a place to visit often for townspeople. Joyce Berg mentioned how the majority of their collections are out on display so there aren’t really new items to see each time one visits. It’s good that the website focuses on events though, being that this is a good community draw to the museum. While the museum might sound like an odd stop for some, I think the visit was definitely worth it. 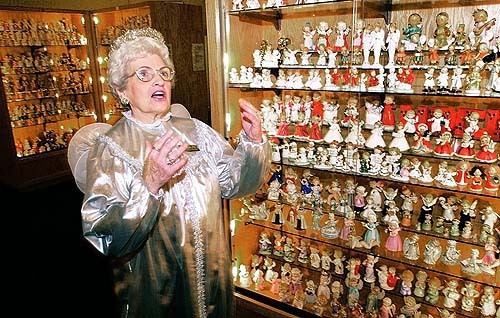 I had no idea how many variations of angel figurines are out there and it was surprising to see them all in one place. This museum is unexpected- which is a great way to reel people into visiting. So many times you go to a museum and you know exactly what art pieces you’ll be seeing or what kind of science you’ll be learning about. collector museums ultimately make you interested in the variations of stuff that is out there. It makes you take a second look at objects you might normally see as junk or clutter. That’s what makes this kind of place special, and it’s definitely worth checking out.